The Command Mesh Kit features all mesh-head pads that deliver an authentic drumming experience. This kit includes an 8"mesh kick with pedal, a 10" dual-zone mesh snare drum, and three 8" dual-zone mesh toms. The set also features a 10" ride cymbal with choke, a 10" crash with choke, and a 10" hi-hat with foot pedal. The included Command Advanced Drum Module features 74 drum kits (54 preset, 20 user) with 671 sounds. You can build a custom kit from your own sounds by loading them via a USB thumb drive. Plus, with 60 play-along tracks and a built-in performance recorder, you'll have an endless source of fun and creativity. All of this mounts to a premium 4-post chrome rack with non-slip clamps, providing a durable foundation that is easy to set up and move. The included Command Drum Module features 70 drum kits (50 factory + 20 user) with over 600 sounds and 60 play-along tracks built-in. To further sharpen your skill, there's a built-in metronome and 1/8-inch input for playing along with your mobile device, so you'll be ready for the studio or stage. There is also a stereo pair of 1/4-inch outputs, headphone output, and a USB-MIDI output for triggering your favorite virtual instrument plugins. The Command Drum Module also features a USB memory stick input. You can use this input to load your own .WAV samples for the ultimate flexibility. Once the .WAV samples are loaded, you can easily assign these to any zone of any pad on the Command Kit. The sonic possibilities are endless! You can also load in .WAV files of play-along tracks using this input. Buy Alesis Command Mesh Kit in discounted set. 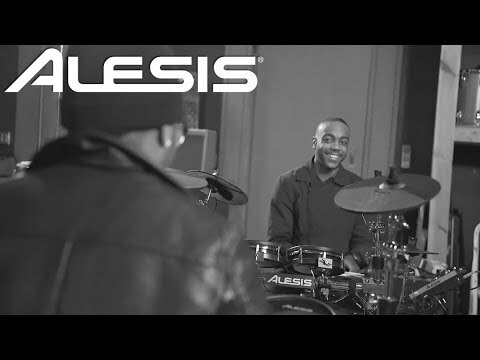 Do you own Alesis Command Mesh Kit or have you had a chance to try it?